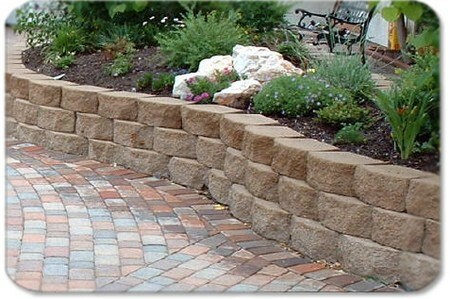 Retaining walls are commonly used in preserving landscaped areas. Retaining walls serve practical construction purposes, from providing vertical edges for sloped areas to supporting level areas. If you have a sloping backyard that you fear may soon collapse, a retaining wall can be a great option for increasing stability. It can help to preserve the area and to utilize it for functional purposes. Retaining walls can be built with a variety of materials, the most common being concrete, wood, and tiles. Although primarily used as functional elements in a landscape, these walls can also be made of more attractive elements such as timber, colored bricks, and stone. Excavation and Layout – Start by excavating the area where the retaining wall needs to be located. On the downhill section, ensure to grade the soil. Drill the wooden stakes into the downhill side and stretch the masonry twine across the stakes. The Footing Trench – Dig a trench on the upper side of the wall. Fill this trench with a variety of colored stones and level it with the help of the rake. Compact the stones together with a tamper. The First Course – Lay out the first base of concrete on the stones. You can use a torpedo level to ensure that the concrete is level on all sides. Continue laying out all the remaining concrete units whilst simultaneously leveling the stones. This stage can be quite dangerous, so be sure to wear protective work gloves at all times. Cutting the First Block – To ensure better grip and placeholders for the vertical joints, cut the first block of every even-numbered row into halves using a sledgehammer and a brick chisel. The Second Course – Once you have cut the first block of all even-numbered rows, it’s time to lay out the second row of concrete units. You will need to step each block back by a few inches to ensure a slight slope backwards. Backfilling – As the wall’s height increases, be sure to tamp down the soil behind it. While you fill the back portion of the wall with soil, also reinforce its strength with an additional material like cement. This added support is always needed for walls that reach certain heights. Final Grading – On the uphill part of the constructed wall, fill the trench with crushed stones. Top it with soil until it reaches a few inches above the final level of the wall. Ideally, the gradient of the soil and the crushed stones should be sloping gently downwards. If you plan on building the wall by yourself, go for ready-made interlocking blocks. The trench should have a minimum depth of ½’ and be wider than the size of an interlocking block. Remember to refill the trench immediately after the completion of the foundation layer.